Joe Mauer has spent a substantial amount of time over the past few weeks on various media outlets attempting to erase memories of his contributions (or lack thereof) to the 99-loss season. He’s working hard. He’s putting on weight. He’s eating Wheaties. He’s saying his prayers. He's drinking nothing but unicorn milk. He’s doing the Rocky IV training in Russia. He’s P90X-ing while Tae Bo-ing. Etc. Etc. Merited or not, he has earned himself a reputation among the media types as being soft. KFAN’s Dan Barreiro had an on-going bit entitled “How Long Would Mauer Milk It?” alluding to various other afflictions (rug burn, paper cuts, etc) and the time the Twins catcher would spend on the bench. This also leaked from being a local gag to a more national sentiment. In fact, Chicago Sun-Times columnist Joe Cowley recently wrote that “Joe Mauer is the guy in the foxhole who’d rather push someone else onto the grenade than risk his hair getting messed up.” That’s a pretty damning view of his character, especially coming from a visiting columnist who does not see the inner workings of the clubhouse last year. True, while he may have ticked off some teammates and writers with his spa treatment in the whirlpool facilities, when he was on the field his performance was substandard for the bar that Mauer had set. Clearly, one of the biggest mitigating factors behind this was his health. It is unfortunate that he has had to jump through these hoops to explain that he wasn’t 100% last year but that comes with the $23 million dollar territory. Vavra, a very astute hitting coach, said he first noticed the change in Mauer late in the 2010 season when he showed less of a tendency to turning on the ball. The subsequent offseason surgery and inability to fully recuperation likely exacerbated his leg issues into the “bi-lateral leg weakness” that sprung up. 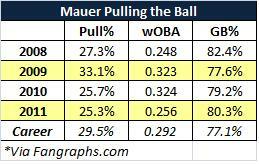 Without much of a foundation, Mauer struggled to pull the ball in addition to lifting the ball in the air. As anyone who has spent one iota of time watching the Twins knows, Mauer’s bread-and-butter has been his ability to go the other way. Not only is he able to drive the pitch on the outer-half to left field, he often uses that inside-outside to muscle pitches on the inner-half the other way as well. After all, he’s a .436 career hitter when going oppo and, during his magical 2009 MVP season in which he smacked 28 home runs, a high percentage of his home runs were actually hit to left field (11 opposite field home runs). Visually, his batted ball spray chart tells the same story. 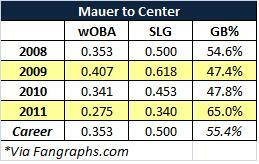 In 2009 and 2010 Mauer placed hits liberally to mid-to-deep center field and right field. That essentially evaporated in 2011 as only a handful of balls leaked out to (and over) the wall. What all this says is that he did not drive the ball as well as he did as recently as 2010. As the data showed above, Mauer definitely struggled to get around on pitches but what’s more is that he was unable to generate any lift. In 2011, just 21.5% of the balls he hit were of the fly ball variety – the lowest rate of his career. This put him in the category with punch-and-judy slap hitters like Ben Revere, Wilson Valdez, Derek Jeter, Ichiro Suzuki and Elvis Andrus – the only hitters ahead of him who hit fewer fly balls. Without a strong foundation, hitters have troubles elevating the ball and without elevation, you lose extra base hit capabilities. A year ago, Vavra cited Denard Span’s head movement as a major impetus behind his drop-off in 2010. That season, Span’s number declined as his groundball rate grew a bit. According to Vavra, Span was demonstrating too much head movement, rising up when the pitch was coming and causing him to shift the plane which led to less square contact. Now Vavra has made a mention of this being one of the issues for Mauer. If Mauer has been doing the same thing, it is not showing up on video footage of him (at least not to the extent that Span’s head movement had shown).Nevertheless, his 55.4% groundball rate in 2011 was the highest of his career and changing his vision plane would be a logical source for this increase. What are the odds that Mauer can bring himself back up into shape for 2012? If healthy in 2012, Mauer should be able to turn on the ball a bit more, adding some lift and distance, and make people forget that he spent in the infirmary. He will likely never match that special 2009 season but as a high average/high on-base, solid defensive catcher, he is capable of being the anchor this team desperately needs.